Horror movies are full of your classic nightmares: apocalypses of various sorts (but mostly zombie); dismemberments and tortures; shaky handheld footage; waking up after a one-night stand with the most annoying woman on the planet. I’m sorry, only one horror film’s done that last one, and it’s Night of the Living Deb, and it combines it with the first one for double the horror. Deb Clarington (Maria Thayer), who is officially described as “endearingly awkward”, has the hots something awful for Ryan Waverly, the prettiest, dumbest heir to a fortune in Portland, Maine. At a party she tries and fails to hits on him, which gets him dumped by his deeply unpleasant fiancée Stacy and, next thing you know, Deb wakes up in Ryan’s apartment. By the magic of film editing and alcohol neither we, nor she, nor he, knows what happened the night before but, nevertheless, Ryan is keen to get rid of her so that he can try to patch things up with Stacy. Deb, for her part, is keen that Ryan not patch things up with Stacy and that he not get rid of her so easily. And to make things easier for her and harder for him, things have gone full-on zombie apocalypse on the streets of Portland. Yes, it’s a zom-rom-com in Shaun of the Dead mode, and very much in Shaun of the Dead mode at that, picking up almost the exact same thematic concerns, about shirking maturity and stalling with mediocre career prospects and dodging filial responsibility – not to mention having nearly the same title. It’s so Shaun of the Dead it could easily have come out eleven years ago: Deb is surprised Ryan doesn’t know Stacy’s number by heart, saying it’s a bad sign for their relationship (? ); for information on the zombie plague, the characters suggest TV and radio (??) but never the Internet (??? ); and Thayer’s portrayal of Deb seems to lean heavily on Rachel – with a little bit of oddball Phoebe – from Friends, which aired its final episode the same year Shaun was released. But there are a few bright spots. For one, the characters discuss and understand the tropes of the zombie movie and, even though again Shaun did it first, it’s still refreshing given that all the serious Z-movies ignore previous Z-movies. Clearly Night of the Living Dead, Dawn of the Dead and 28 days later… exist in this fictional universe; I wonder whether Shaun of the Dead does. So that’s nice. Secondly, the obnoxious cringe comedy that takes up Deb’s first half gives way to in the second half, to something that works much better both as a comedy and as a horror film. Uncoincidentally, it picks up exactly when tireless genre hero Ray Wise enters, all twitchy dark secrets and brownie recipes. It’s almost annoying how many of these fantastic talents work exclusively in genre material; on the one hand, you feel that maybe they’re wasting their own potential, but on the other, someone has to do the dirty job of being the best thing in Jeepers Creepers 2, haven’t they? Finally, the very final scene contains the best twist I think I’ve actually ever scene in a zombie film, and if you want to know what it is, then you’ll just have to watch this, and while sitting through the first half trust me – it gets better. 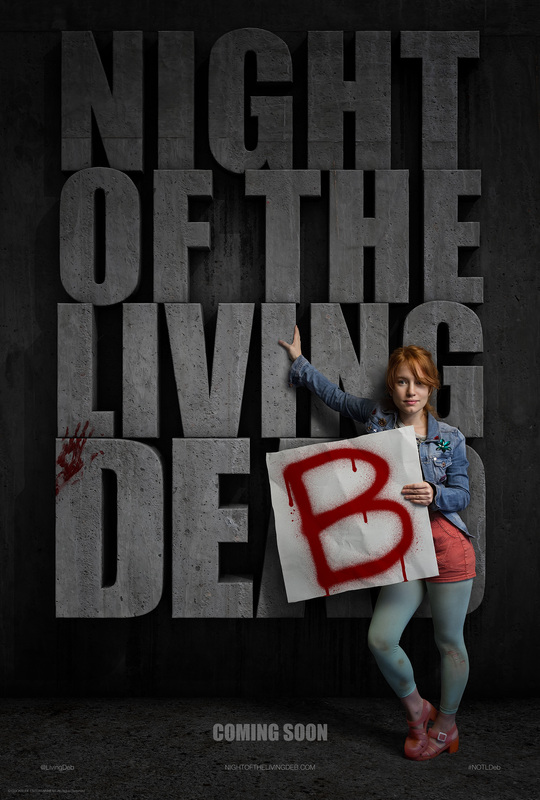 Night of the Living Deb! is released on VOD in the UK from October 19th through FrightfestPresents. Will you be checking it out? Let us know in the comment box below! I thought I was being fairly negative, but definitely give it a look if you like the sound of it. Let me know what you thought!